20 hours driving to Big Spring. 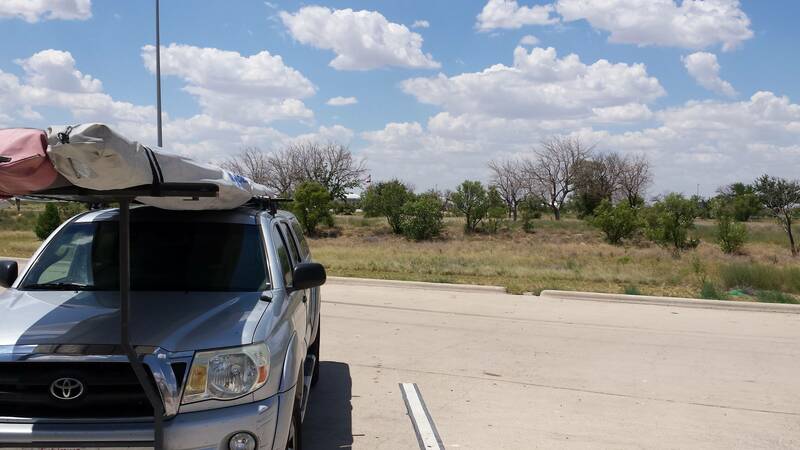 With an early start I did 14 hours the first day stopping in Las Cruses, NM overnight. Not as hard as I expected. Credit goes to Redbull. It keeps me alert without making me stop to pee. Fourteen hours is 3 cans. Cruise control keeps me from going too fast. At 2am I am woken up by a thunder storm. The next morning I only have 6 hours to go so I have a leisurely breakfast across the street. At rest stops I do my texting and arrange for a chase driver and 3 more pilots to fill the truck. Kendall didnâ€™t come this year. I was afraid, without someone to share expenses, it would be costly. He said not to worry because it always works out. He was right. I even got a pilot to share the room at the Plaza Inn. Texas sky cloud base 12,000 what could be easier? Please keep those reports coming! Thanks Jay. In years past I have always enjoyed your comp reporting and I'm sure many others feel similarly. Have fun and fly far! Did you do a practice task yesterday or were you busy arranging the truck logistics? How about today, any news on the task? How many tugs do they have?